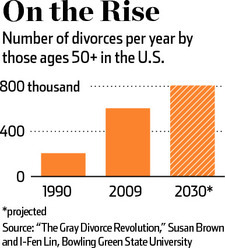 Are you Headed towards a Gray Divorce? Barbara and Jack got married twenty-four years ago. Barbara is fifty-one and Jack is fifty-two. Their oldest daughter is in college and their younger daughter, a high school senior, is soon going off to college as well. Over the years Barbara and Jack have drifted apart, avoiding each other in an attempt to keep the bickering to a minimum. Barbara’s numerous attempts for more emotional closeness have failed. In her frustration, she has turned to her sister and women friends to meet her needs for closeness. Jack has grown bitter due to Barbara’s repeated rejections of his sexual overtures. He diverts his pent-up energy into sports: basketball, mountain climbing, and long distance running. Despite their parallel lives, the tension in their home is high. When Barbara contemplates her future, she can’t imagine spending the next twenty-five or thirty years feeling this unhappy. After many months of careful deliberation, she concluded that she will be better off alone than in the anger, resentment, or boredom that she is currently experiencing, and she decided to announce her plan to separate and divorce to Jack and both daughters on their spring break from school. Shortly thereafter, Jack and Barbara put their house on the market and six weeks later, they moved into separate households. “Gray divorce” is the term used to refer to those who divorce after age fifty. According to an article in the Washington Post last year, the divorce rate for this group had doubled since 1990 and today one out of every four people experiencing divorce in the US today is over 50 – nearly epidemic proportions. And it’s the women who are initiating most of these breakups. In a paradoxical way, the retirement years have become as critical for marriage stability as the first years of marriage has traditionally been viewed. This phase of your married life can sneak up on even the most discerning couple. You’ll go through the first 25+ years of marriage full-steam-ahead focused on advancing your career, raising the kids, and ‘living the dream.’ You’ll then wake up at some point and realize that you and your wife are about to have a lot of alone time together and you’ll be faced with the reality that you need to figure out what to do with the rest of your lives – individually and together. What do you share in common? How have you grown together or apart over the years? How do you stay connected? Do you really know how your wife feels about the years you’ve been together thus far? Are there scars (or shrapnel) either of you have from the past that have not healed or, worse yet, have never been addressed? You’ll want to know the answers to these questions as you transition to the post-kid phase of your marriage. Find common interests that you both share. These may involve travel, sports, books, cultural activities, or even volunteer/ministry opportunities. The more interests you share, the more joy you’ll likely find in being together. Set goals – together and as individuals. These goals can be related to your family, finances, giving, work, and your personal growth. A business can’t survive without goals, why wouldn’t a couple benefit from the same? Without some direction, married life can feel like an aimless journey. Don’t “retire.” The word “retire” has always struck me as somewhat defeatist. Determine how God can make great use of your skills and talents in the ‘veteran’ part of your marriage and life. It may be as simple as investing time in your grandchildren or as strategic as creating a new business or ministry. You’ll stay active mentally and physically. Speaking of grandchildren, we can all aspire to be exceptional grandparents. By this stage of life you have the benefit of age, experience, and wisdom with an advanced degree from the ‘school of hard knocks.’ Use the luxury of your time availability and your advanced degree in wisdom for the benefit of the next generation or any other people God may put in your path. Short and hopefully a bit helpful to a few of you out there. As always, I welcome your comments and additional ideas that will benefit other readers!